Panama City is the capital of Panama and over half of the country’s population live here. It is a popular tourist and retirement destination, and bisected by the Panama Canal. Compared to most other cities in Central America, Panama City feels more modern and it has attracted a large number of foreign expatiates from countries such USA and Canada who wants to enjoy a tropical climate without having to give up the comforts they’re used to from their native lands. The proliferation of sky scrapers and other high-rise buildings has given the city its nickname “The Dubai of Latin America”. The traditional colonial architecture of Panama City can be experienced in the part of the city known as Casco Viejo. 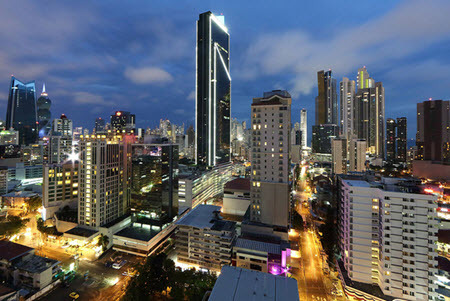 Panama City offers excellent shopping, including many high-end stores located in the banking district around Via España and in the malls around Paitilla. For more budget-friendly goods, check out the pedestrian walkway Avenida Central and its side streets, or visit the Los Pueblos outdoor mall. Panama City is serviced by a subway system and public buses. There are also a lot of taxis. Below are just a few examples of the many interesting features that Panama City has to offer. The Panama Canal is an essential part of not just the country as a whole but also of its capital city. Tourists wanting to see the canal for themselves typically head for the Miraflores locks, where you can watch the huge freighters go through. There is a visitor’s centre here with a museum where you can learn more about the canal and how it was created. A metrobus to Miraflores leaves from the Albrook metro station. Several companies based in Panama City offer air tours where you can watch the canal from above. The first incarnation of Panama City was sacked by Henry Morgan and his fellow pirates in the 17th century. Today, only the ruins are left. Casco Viejo is the old colonial-style part of Panama City and the home of many churches, museums, cultural venues, restaurants and official buildings. A lot of cultural events take place here – indoors and outdoors. Amador Causeway connects three islands to mainland Panama. For the residents of Panama City, it is an important spot for outdoor recreation. Blend in by bringing your roller-blades or bike, or why not go for a run? Bikes are available for rent, including tandem bikes. From the Amador Causeway the view of Panama City is stunning. Panama City has three airports: Tocumen International Airport (PTY), Gelabert/Albrook Domestic Aiport (PAC) and Panamá Pacifico International Airport (BLB). The Tocumen International Airport is by far the largest of the three and is in an important flight hub for the entire Central American region. A large number of airlines frequent this airport and offer direct flights from various destinations in North America, South America, Europe and Asia. Domestic flights within Panama are also also available. Gelabert/Albrook Domestic Airport is a former US military airfield. Nowadays, it is used for domestic flights within Panama – typically with small jet aircrafts. Daily flights available to the country’s major cities. The major carrier is AirPanama. At the time of writing, Panamá Pacifico International Airport (Howard Wilson US Air Base) is utilized by two airlines: Veca and Viva Colombia. Veca flies to San Salvador in El Salvador twice a week. Viva Colombia have daily flights to Bogotá, and four flights a week to Medellin. The airport was quite recently converted for civilian use and is a no-frills facility for low-cost airlines. Panama City has a modern bus terminal utilized by several long-distance bus companies, including Tica Bus, Expreso Panama and Easy Ride Panama. The bus terminal and the nearby metro station are both called Albrook. There is a large mall adjacent to the bus terminal where you can have something to eat, use the restroom, shower or do some shopping before you venture out into the city. Great if you have been stuck on the bus for a long time. There is a daily train service between Colón and Panama City. The train leaves from Panama City in the morning and travels along the Panama Canal. After making a stop in Colón, the train heads back to Panama City and arrives in the capital in the afternoon. Great day excursion if you want to see more of the canal and the Panamanian landscape, but remember that Colón has a higher crime rate than the rest of the country.